Montenegro has been in a state of deep political turmoil for half a year already. This crisis is manifested by frequent street protests against the regime and, above all, against its head, Montenegro’s seemingly eternal PM Milo Đukanović. Protests are led by the Democratic Front (DF) coalition, which is predominantly against entering the NATO, since its strongest party New Serb Democracy has very strong anti-Atlanticist agenda. The protests are stubborn and survived months of various kinds of pressures, media manipulations and police brutality. Protest leaders want the government to resign as the dimensions of state corruption grew preposterously. Yet the main problem of Montenegro is not material but moral corruption and bankruptcy, centred on the question of Montenegrin identity. Montenegrins are Serbs, and this truth, ‘politically incorrect’ for the regime and its clients, is exactly what the ruling ideology is depriving Montenegrins from being. This ‘elephant in the room’ is not always mentioned in the protests, but it is in the underpinning issue visible in the protests visual and symbolism identity – flags people wave, songs they sing, slogans they chant. During the protests, in these small moments of liberty, when people can express themselves and vent some of the mounting frustrations they are forced to bear for years. Serbophobia was a marginal discourse, but Đukanović mainstreamed it into state ideology. Formerly a proud Serb himself—who came to power in the 1990s as a rising star of the Montenegrin section of the Communist Party—actually entered political stage riding on the wave of Serb sentiments of Montenegrins. Before the 1990s, during the era of communist Yugoslavia, Montenegrins were also persuaded not to be Serbs, officially being proclaimed a separate nation, according to the Leninist recipe of forming national republics in federal states. This however did not work and Serb identity burst out in the series of protests in late-1980s and early-1990s, when Đukanović portrayed himself as one of the most prominent young Serbs within the Communist Party. But Đukanović turned coats over time for pragmatic reasons, making choices that kept him in power. Initially under the guise of opposing the undemocratic regime of his former political mentor Slobodan Milošević in late-1990s, Đukanović skilfully garnered the support of the political West, set on the course of fragmentation and atomisation of Yugoslavia and the Serbian space into statelets without sovereignty. After the highly irregular independence referendum of 2006, organised under the auspices of EU, which easily favoured geopolitics over its own proclaimed democratic standards, Serbophobia became the state policy. When Montenegro was separated from Serbia, the new task was the same as decades earlier, inventing Montenegrins. This time not as Serbs, ‘Serb Spartans’ as Montenegrins like to call themselves, but as a separate entity, different from and thus opposed to Serbs. Montenegrins in conflict with themselves. The 2007 constitution invented ‘Montenegrin language’, the use of Latin alphabet is being promoted at the expense of traditional Cyrillic, constant attempts are made to deprive Serbian Orthodox Church of its shrines and other property, while alternative interpretations of history are constantly being invented. The list of mainstreaming Serbophobic policies goes on. The culmination of the protests came with NATO inviting Montenegro into its ranks. This is a very controversial issue, as Montenegrins vividly remember the 1999 NATO bombing. Milo wants the issue to be voted through the parliament, knowing he could not push this through a referendum, as the vast majority of citizens (including many of his own voters) are firmly against NATO. Nevertheless, some of the ultra NATO supporting parties see Đukanović as a sinking ship, so they want to change teams, without changing their anti-Serb and pro-NATO policies. One of these is the Ranko Krivokapić, parliamentary speaker, hawkish Serbophobe and leader of a tiny far-right party, ironically named Social-Democratic Party (SDP), coalition partner of Đukanović for 18 years. Unlike Milo, whose Serbophobia come from political pragmatism, Krivokapić is a true believer. After Krivokapić left Đukanović, Montenegrin PM found himself in a problem, as the vote of non-confidence came on parliamentary agenda. Without the votes of Krivokapić’s remaining loyalists (Đukanović previously made sure to carve out a part of SDP) the solution was found in four opposition MPs from the Positive Montenegro, another tiny Serbophobic party, with yet another bizarre name. These two voted for Đukanović’s government in exchange for petty privileges of its leaders. This however only bought some time for Đukanović, leaving all the problems in place, the identity issues still being that ‘elephant in the room’. Political crisis will certainly continue and is likely to grow, so will the protests of citizens and parties that boycott the parliament. The votes of Positive Montenegro only procrastinate the agony. 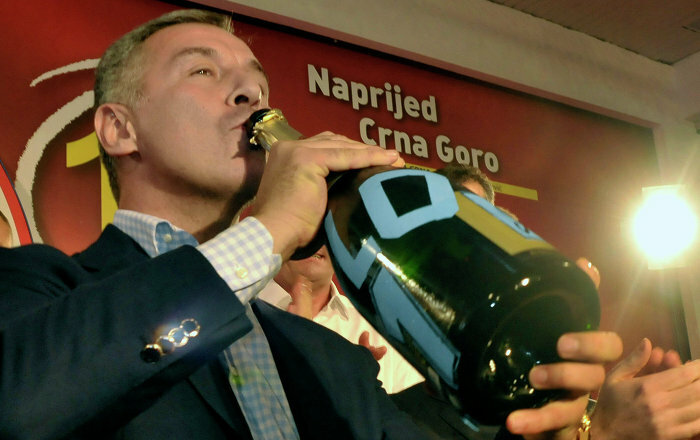 The bottom-line is that it is not enough to get rid of Đukanović regime for Montenegro to be liberated, if it is to be replaced with other NATO stooges, such as Krivokapić and co. The whole ‘Independent Montenegro’ project is based on an unnatural anti-Serb paradigm and should fail and fall together with Đukanović. Montenegro needs to come out of its nightmare and to come back to its Serb identity, while all other outcomes would be fake.